Geneva, often referred to as "Peace Capital of the World", is situated between the shores of Lake Geneva and Mount Salève. 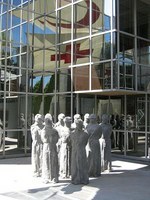 Switzerland's second-largest city is a global city, a financial center, and a worldwide center for diplomacy, known for being headquarters for many international organizations such as the United Nations and the Red Cross. It is also the place where the Geneva Conventions were signed, which chiefly concern the treatment of wartime non-combatants and prisoners of war. Geneva, home of Calvinism, was one of the great centers of the Protestant Reformation. The Protestant leader John Calvin was based in Geneva from 1536 to his death in 1564 and became the spiritual leader of the city. Geneva is cosmopolitan, cultured, immaculate, and among Europe's most interesting cities to visit offering a wide variety of attractions and activities within ist city limits as well as in the Lake Geneva Region. Geneva features the world's tallest fountain, the Jet d'Eau with its 140 m (460 ft) plume, churches and cathedrals, such as the St. Pierre Cathedral where Calvin preached the Reformation, a Medieval Old Town, the University, the Opera, numerous libraries, monuments and museums such as the Horology Museum which highlights the importance of clock and watch making to the Genevan economy, and many beautiful parks and gardens to relax in. More information about attractions and activities in Geneva and surrounding regions. Geneva is located between the Alps and the Jura mountains, at the south-western corner of Switzerland where the Rhone River leaves Lake Geneva. 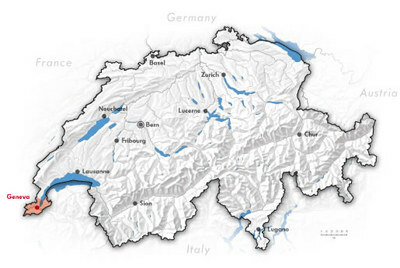 The city is almost completely encircled by France - out of 107.5 km (66.8 miles) of borders, the Canton of Geneva has only a 4.5 km (2.8 miles) long border with the rest of Switzerland while 103 km (64 miles) are shared with France. 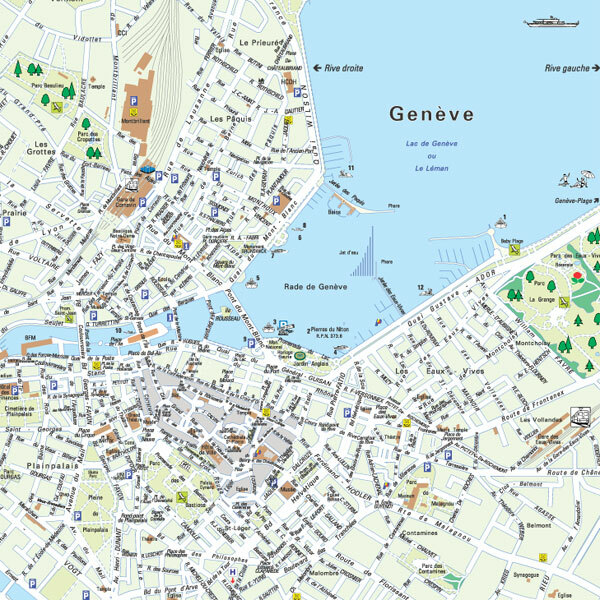 Situated at an altitude of 374 m (1,226 ft), the city of Geneva including its 8 districts has an area of 16 km2 (6.2 square miles) plus the part of the lake that is attached to the city with an area of 38 km2 (14.7 square miles) - referred to as "Petit Lac" (small lake). 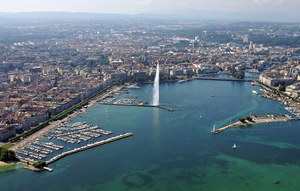 Due as much to its location as its international status, Geneva serves as a transportation hub for most of French speaking Switzerland and for access to the Swiss Alps from points west. The international airport of Geneva-Cointrin is served by almost all European carriers as well as a few daily trans-Atlantic flights, and within the last few years has become a hub for Easy Jet, the low-cost carrier serving a number of destinations in Europe. The airport is located just 5 km (3 miles) from the city center on the border with France, within only 6 minutes by train, and the taxi ride takes less than 20 minutes. Express Trains to/from Bern, Zurich and Basel leave/arrive every hour at Geneva's "Gare de Cornavin", the main railway station. International trains leaving/arriving from/to Cornavin include the high-speed TGV, the direct train service from/to Geneva to/from Paris (journey time of only 3.5 hours) as well as a direct service to/from Nice. 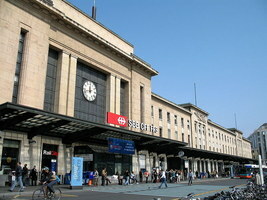 Geneva is also the starting point for the night train service to Barcelona and many Italian cities are connected to Geneva, notably the "Cisalpino" service, connecting Geneva to Milan, Venice, Florence and Rome. The "Gares des Eaux-Vives" is an other railway station situated opposite the main train station offering train services with the SNCF (French trains) to and from Evian, Chamonix and Annecy. In recent years, highway construction within Switzerland and in neighboring countries has turned Geneva into a highway intersection for Europe. Heading south, motorists can pick up the "Route Blanche" on the city outskirts to reach Chamonix and the Mont-Blanc within 1 1/2 hours, and Italy (via the Mont-Blanc tunnel) within 2 hours. A branch of this same highway offers the rapid links Geneva-Grenoble to the south and Geneva-Lyon to the west, with continuing connections on to Paris. To the north and east, the A1-motorway connects to the well developed motorway network linking Geneva with the other Swiss destinations.